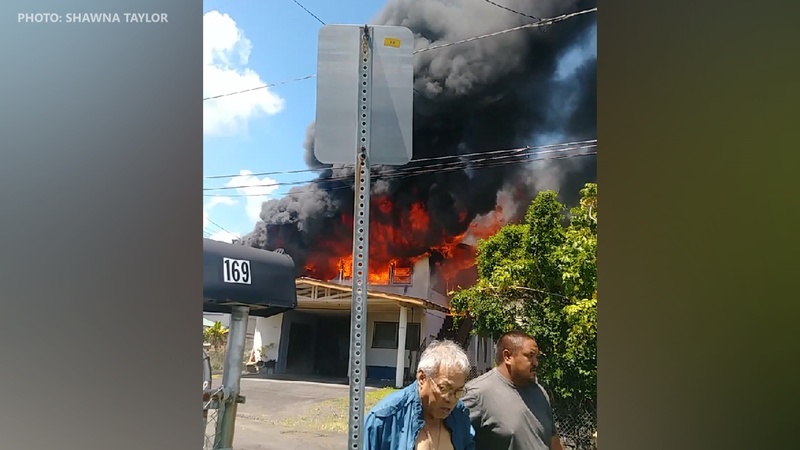 HILO, Hawaii - The upper story of a Mauna Loa Street structure was fully involved when fire fighters arrived on the scene Sunday morning. (BIVN) – The top floor of a two-story residential structure on Mauna Loa Street in Hilo was engulfed in flames on Sunday, before fire crews extinguished the blaze. All the occupants of the structure were out and accounted for, fire officials say. The cause of the fire, which began at 10:43 a.m., is undetermined. Fire suppressed with exterior master stream and blitz line attack for initial knock down. Primary and secondary search with hand lines and thermal imaging cameras by two separate entry teams. All occupants accounted for. Electric, water, and gas utilities shut down. Overhaul completed with TIC, wall and ceiling drywall removed as needed to ensure extinguishment, applied Class A foam. Scene turned over to Fire Inspectors for ongoing investigation. The fire department dispatch estimated a $200,000 loss due to the fire.